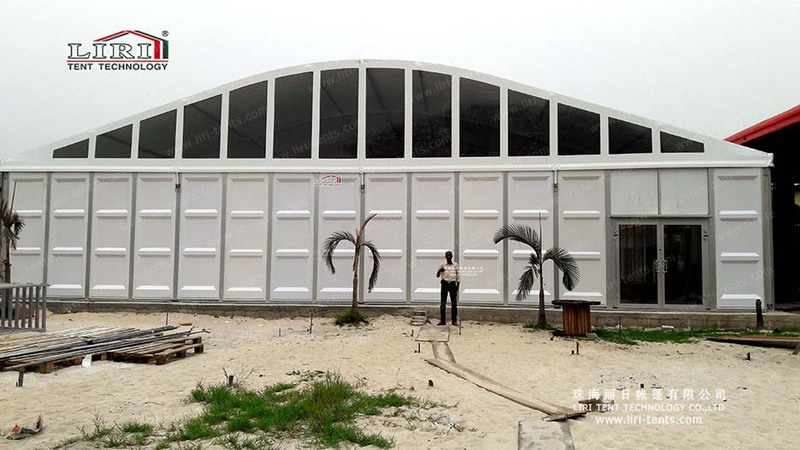 Arch roof tent can be widely used as the weddings tent, party tent, exhibition tent, conferences tent, events tent, etc. This tent is available in clear span width from 3m to 60m and length 3m or 5m bay distance. Also you can change the roof shape to A-shaped, arcum top, dome , curved or double decker. The frame material of tent from Liri Tent factory is hard pressed extruded aluminum 6061/T6. And the cover material is double PVC coated polyester fabric, which is waterproof, UV resistant, fire retardant according to standard NFPA701. Optional accessories include glass door, glass wall, ABS wall, linings, curtains, tables and chairs, etc.